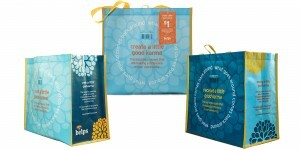 Hannaford “Good Karma Bags” support NHBCC! For the month of January 2018, the New Hampshire Breast Cancer Coalition will receive a $1 donation from each purchase of a specially designed blue Good Karma “Helps” reusable bag at Hannaford in Hudson, New Hampshire. Hannaford Helps bags with the “Good Karma” message can be found on the reusable bag rack and at various registers.